Freight Trains in the Tōkyō area operate on both freight-only branches and on mainlines shared with commuter and other trains. This results in scenes such as freights rolling through passenger stations. Most contemporary freight in Japan is now unit container or tanker trains. Most trains are pulled by electric locomotives (the U.S. designation of “motor” for an electric locomotive doesn’t seem to be used in translated references, they’re just called locomotives), although the ubiquitous DE10 diesel appears on non-electrified branches and occasionally in other uses. 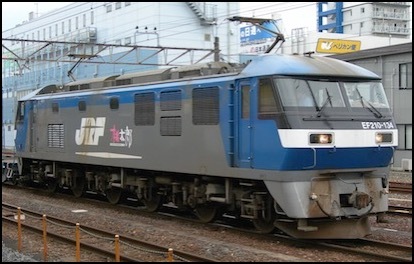 Japanese locomotives are identified by a two-letter code identifying their type (“D” for diesel, “E” for electric) and the number of axles (“D” for 4, “E” for 5, “F” for 6, “H” for 8), suffixed by a number to differentiate one from another. When JNR was broken up, JR Freight started using three-digit numbers rather than two-digit, and this carried over to models produced by the other JR companies, so a three-digit class number identifies a post-1987 design. Thus a DE10 is a diesel, 5-axle, locomotive from the JNR era, while an EF210 is an electric, six-axle, locomotive from the JR era. The JR Freight EF210-100 was introduced in 2000 as a reduced-power (3,390 KW, 5,270 HP) variant of the EF200 (6,000 KW, 8,046 HP), following the earlier EF210-0, which remains in service. Like the 200, it has six axles arranged as three pairs. It operates on 1,500 volt DC from overhead wiring, and has a maximum speed of 110 kph. It weighs 100.8 metric tons. The number of EF210 built outnumber the EF200 by more than 3:1. They have largely been used to replace aging EF65 and EF66 locomotives pulling container unit trains. 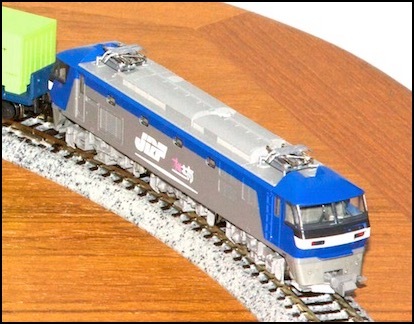 The Kato model, introduced in 2002, has a flywheel drive and working headlights, but is not equipped for DCC. The specific one I have represents a slightly older version of the EF210-100, I believe.